I'm 17 years old and live in Henderson TN. 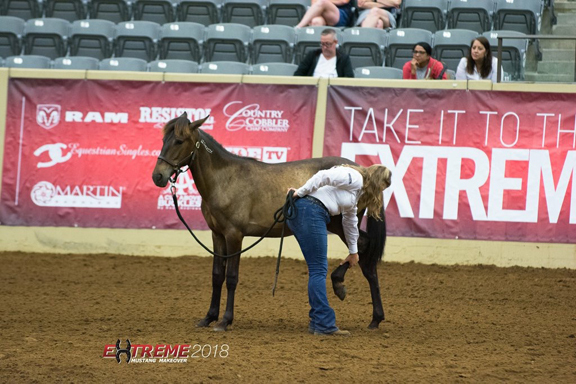 This year I had the amazing opportunity to compete in the Extreme Mustang Makeover, Youth Division at the Kentucky Horse Park in Lexington, KY.
My journey began on February 23, 2018 when all the competitors met in Lebanon TN to pick up the Mustangs.I had applied in December for the Makeover and was informed in mid-January that I was chosen. Each person was randomly assigned a wild Mustang. 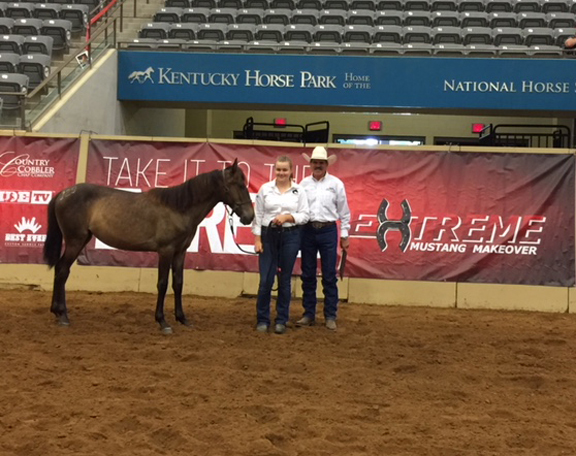 The youth competitors got one between the ages of 10-24 months, and the adults were assigned 3- to 6-year-old horses. I was assigned an 11-month-old filly from Nevada. She was this scraggly little bay who was very stand-offish in the pen and basically ignored everyone. I named her Andromeda and her nickname is Andy. When it was our turn to load, they ran her down a chute, put a halter on her, and then ran her into our trailer. She was pretty calm the entire time, but didn't like all the people around her. For the first two months I kept her at a boarding facility in Jackson, TN – Campbell’s Performance Horses. For the last month and a half of training, we brought her home periodically so she could go out in the pasture. Campbell’s kept our stall available if we needed it. The first night we got her home I sat with her a little while and she was really tolerant. She allowed me to take off her neck tag and pet her, but she showed hardly any curiosity. She was “zoned out” and most likely overwhelmed by the stress. The next day was better; she trusted me really quickly and by the end of the first week, she was meeting me at the gate. She learned extremely fast! I would start teaching her something one day and by the next day, she would be doing it easily. She learned to lead, lay down, longe, pick up her front feet, tie, bathe, and was desensitized to a number of things – all in just a week and a half. She took everything calmly and trusted me to not put her in a bad situation. I had never experienced anything quite like it in my 17 years of being around horses. The bond I have with her now is incredible! When I walk out to her pasture, no matter where she is, she comes running to see me. I have never had a horse so willing and loyal. There were definitely some downs during the time I had to train her. I had some help in the beginning from my trainer Shane Campbell. He helped with teaching her to longe and showed me some basic ground work exercises. As she got comfortable in her surroundings, her personality started to develop. She is very sassy and constantly wanted to play. I had to be careful around her sometimes, because she didn't realize her own strength and power compared to mine. She was never aggressive, but she would get to playing and start rearing and bucking like a typical baby horse – and she expected me to play with her like another horse. I had to start correcting her and teach her she couldn’t play on top of me. Personal space was a big issue, but I believe a lot of that had to do with her age. I never had to work hard to correct her. She was very sensitive and responded easily to me. Andy is very light on her feet, is an incredible jumper, and I think she will make a nice dressage horse in her future. Her build is small, as most Mustangs average around 14 to15 hands tall. After about 117 days of training, we made the trip to Kentucky. My classes spanned over two days, all in-hand, and I was competing against 34 other youth. I had a Handling and Conditioning Class, a Trail Class, and a Freestyle Performance, which I had to create on my own before the competition. We placed in the middle overall, but I was still very proud of Andy and how hard she tried. All of the youth adopted their Mustangs at the end of the competition, so we were able to keep them. The adults have to auction theirs at the end and the proceeds help fund the Makeover. I had the choice that if I wanted to reassign Andy to another adopter I could. But there was no way I was going to be able to part with her! Through this entire process, I have learned so much: patience, understanding, responsibility, teamwork, trust, loyalty, and all around good horsemanship. I saved the first Mustang, of what I hope to be many more, from the holding pens, and to me, that is the most important part. We might not have won the competition, but I made some amazing friends and found one outstanding best friend in a wild Mustang.